ALHAMBRA.–The future is bright for Mark Keppel’s girls’ basketball team and it’s wearing number 3. 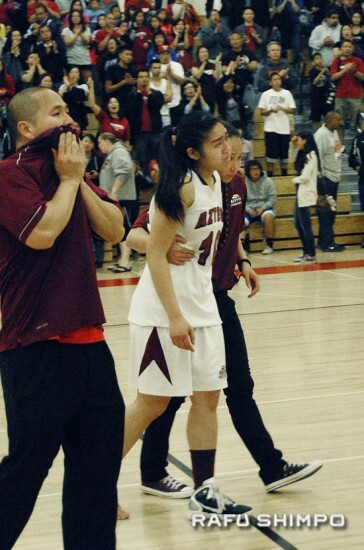 Many of the Lady Aztecs were inconsolable after their heartbreaking 60-58 loss to Palisades in the CIF State South Regional Div. II quarterfinals on Saturday, but Lauren Saiki stood with a look of steely resolve. This is the same Saiki who wept openly after Keppel’s two previous games–one of them a win. Keppel appear to be all but done for on Saturday, when their star player, junior Alyson Lock, turned her right ankle in the second quarter and was done for the game. With their go-to player on the bench and trailing 58-56 with about 10 seconds left to play, Saiki calmly dribbled the length of the court, split the defense and sank a floater to tie the score, leaving seven ticks on the clock. Palisades wisely used a timeout, then drew up a perfect inbound play to find a wide-open Skai Thompson, whose layup dropped with just over three seconds left on the clock. 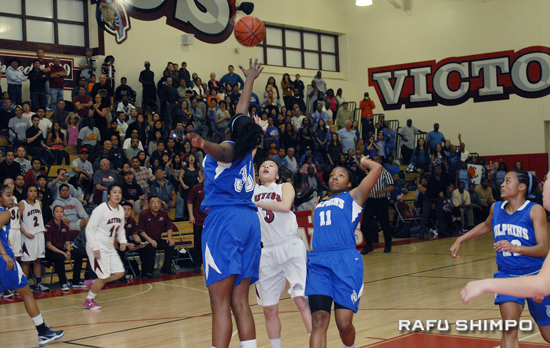 Have no timeouts remaining, the Lady Aztecs got the ball to Saiki, who was unable to get off a shot before the buzzer. Assistant coach Joe Kikuchi did his best to retain his composure as he praised the girls after the game. A crestfallen Alyson Lock is helped from the court by assistant coach Krista Arase, as the home fans applaud their team after Saturday’s loss. Head coach Hon Trieu, left, wipes away tears. Head coach Hon Trieu and the rest of the staff left the players in the locker room for several minutes after the game, letting them come to grips with the end of their season amongst themselves. Lock was fit to be tied in the waning moments of the game, powerless to stand unassisted, let alone get onto the court. Afterwards, she fought tears to thank her teammates. “I’m so proud of my team. They stayed in there, even though I was unable to play,” she said. Players often use the term “step up” to refer to taking on added responsibility when needed most. For the Aztecs (28-5) several times this season, that player has been the wispy Saiki, a frosh who looks as though a stiff breeze would blow her over. For her part, Saiki said that when they needed a basket at the end of the game, she knew if she got the ball, it was her duty to score. Next year, Keppel figures to have a solid roster – including Lock – after losing only one senior, Sandra Gao. Saiki, who this year displayed terrific outside shooting, will likely be joined by Kyrstin Nakamura, who was moved up to varsity for the playoffs and sank four 3-pointers in their win last week. Also returning will be Samantha Lee, the junior who took matters into her own hands on Saturday and led Keppel with 24 points–all on 3-pointers. Saiki finished the night with five, Lock had 10 and Tammi Matsukiyo added two. Kylie Mizushima scored four points on Saturday for Palisades (30-5), who will hit the road to face J.W. North tonight. In Div. III, Laguna Beach survived a late charge by West Torrance to advance with a 53-44 win. West erased most of a 10-point deficit early in the fourth quarter, drawing to within as close as four with just over four and a half minutes to play. That was as close as the Warriors would get, as Laguna recorded some timely steals and key field goals to pull away with time running out. Kylie Fujioka led West with 11 and Nicole Nitake added 10. Justine Yamashiro netted and Kayla Sato had three points. West finishes their season with an overall record of 26-7. Brooke Shimazaki scored three points in the win for the Lady Hawks (24-8), who now move on tonight for a rematch with Alemany, who they outlasted in a classic double-overtime battle for the Southern Section Div. 3AA title on Feb. 29. Tip-off in the regional semifinal at Laguna Hills is set for 7 p.m. In the Div. I regionals, Huntington Beach posted little challenge for Mater Dei, in a 80-52 loss in Santa Ana. Mater Dei held Kylie Minato, who had been averaging more than 26 points per game, to just nine. Jill Nakaso added six for the Beach, whose season ends at 26-6. Kau’ilani Miki-Han scored three for Mater Dei (31-3) in the win. The Monarchs will take on Summit on Tuesday night. Also in Div. I, Jamee Katsuyama did not score, but her Brea Olinda team slipped past El Toro, 65-42. The Lady Cats will move on to the semis tonight at home against Long Beach Poly. In Div. II, Culver City’s season crashed to an end with a 20-point drubbing by Monache, 62-42. The Centaurs finish a fine season at 22-9. On the boys’ court, Pasadena breezed past visiting Bell on Saturday, 77-44, in the Div. II quarterfinal. Freshman Joey Toyama scored two and was one of several reserves who saw action as coach Tim Tucker took the opportunity of a blowout to give his starters some well-earned rest. The Bulldogs advance tonight to face St. John Bosco at 7 p.m. It is a home game for Pasadena that will be played at a neutral site, Monrovia High. In Div. I, Jamie Kobayashi and Mater Dei advanced with a 78-66 victory over visiting Mission Viejo. The Monarchs host Loyola tonight at 7:30. Whoa. See you at the game(s) next year.